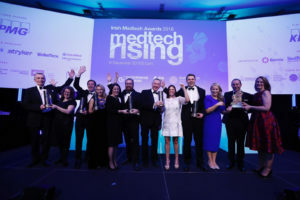 Medical technology firm, axial3D has been selected as ‘Emerging Medtech Company of the Year’ at the Irish Medtech Excellence Awards. The award was based on strength in the key areas of strategic vision, customer focus and innovation. The company, founded in 2015 and headquartered in Belfast, is making 3D printing accessible to the entire healthcare sector – delivering personalised anatomical insights directly to a clinician using a combination of innovative software and expert services. The state-of-the-art technology has seen axial3D achieve considerable success in its short history, partnering with many prominent healthcare professionals and organisations across the globe. Daniel Crawford, Founder, and CEO at axial3D said “We are extremely proud to have won the prestigious award of ‘Emerging Medtech Company of the Year’ at this year’s Medtech Excellence Awards. 3D printing is revolutionising patient care in hospitals across the world. The Irish Medtech Excellence Awards, now in its 12th year, is jointly hosted by the Irish Medtech Association, Enterprise Ireland and IDA Ireland. The ceremony recognizes and celebrates companies that have played a leading role in making Ireland a location of choice for global Medtech. The Irish Medtech sector employs over 38,000 people in over 450 companies across the island, and is the second largest employer of Medtech professionals in Europe, per capita. The sector is expected to add an additional 4,000 employees by 2020.